A friend recently sent me this in an email and I had to laugh because it describes my father so well. He was green way before there was such a thing as an Earth Day. Back then we called it being cheap, or on kinder days, "thrifty." It's amazing how much thrifty and being green have in common. We had one car. But my parents didn't fight over who got to drive it. My dad walked, jogged, or rode his bike to work. My mother walked to her volunteer job at the hospital. The car was for grocery shopping and car trips. We made our own lunches and took them to school, bringing back the lunch box, thermos, and plastic sandwich bags to be washed and reused. Our home's thermostat was never set above 55 deg. F. When the winter winds blew, rattling the old windows, we'd pile on extra sweaters and my dad would put up his homemade double windows (plastic sheeting over a frame, inserted into the window frame - very classy). We'd get in trouble for huddling next to a heating vent, hogging up all the heat, but on the days when our breath was visible, it was worth it! We had a push mower. Not one that's gas powered. One that's human powered. I know from lots of personal experience that it takes a lot of work to mow a lawn with a push mower. Pushing the mower was only part of the effort. There were also the frequent stops to empty the grass catcher onto the compost pile. Yes, we composted way before it was cool. It only makes sense to compost when you have a garden where you grow a lot of your own vegetables and have fruit trees that inundate you with apricots, cherries, and plums. Since I was raised this way, I am still fairly thrifty. Thus, one of my favorite places to shop is the thrift store. It's like a treasure hunt, sifting through other people's cast-offs to find that one thing you've been looking for. One of the things on my wish list was a cast-iron pan. I am weaning myself away from non-stick (toxic fumes and nastiness leaching into my food is not a bonus for me) and was delighted to acquire a rugged cast-iron pan at the thrift store for only $7. Usually something is discarded because there's something wrong with it. Such was the case here. The pan was wearing a rust coat. It looked like it had been someone's camping skillet and was left out in the rain. Fortunately, I have a super fabulous husband who's handy with tools he sanded it with power tools, creating a silky smooth surface. Then I seasoned it with flaxseed oil, a time-consuming process, but one that gave it a nice start to being non-stick. Now it is our go-to pan for all things breakfast. Eggs, sausage, and even grain-free pancakes cook up beautifully in it. Grain-free?? Yes, you read correctly. 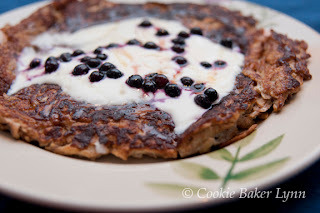 Pancakes without grains are possible. This lovely pancake was made with shredded apples, topped with yogurt and blueberries. Breakfast bliss! And the bonus with cast-iron is that you get extra iron in your food. And if you buy your pan from the thrift store or a garage sale, you're recycling! You can't get much greener (or healthier) than that. 2- In a large mixing bowl, beat the eggs. Add the apple and cinnamon and stir to combine. 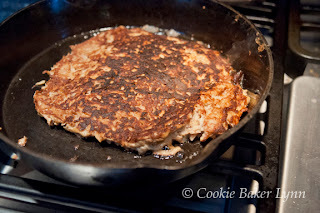 3- Place your skillet (cast iron rocks!) over medium heat. Grease it generously with either butter or coconut oil. 4- Pour about 2/3 cup of the mixture into the heated pan. Using a wooden spoon or heat-proof spatula, gently smooth the batter to the sides. 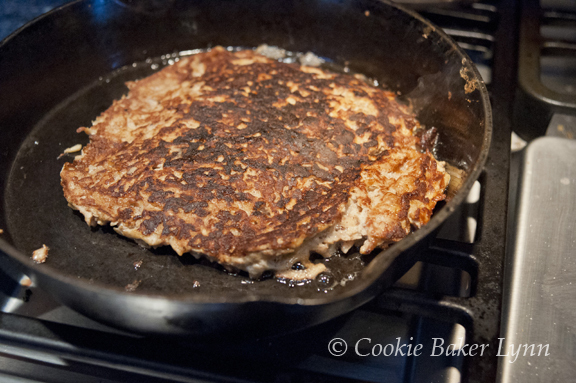 5- When the pancake is nicely browned on the bottom, but still wet on the top, flip it over to cook the other side. To flip, slide the pancake onto a plate with the wet side up. Place the plate over the skillet and quickly invert it. 6- Cook the second side until done and slide it onto a serving plate. 7- Top with your favorite toppings. 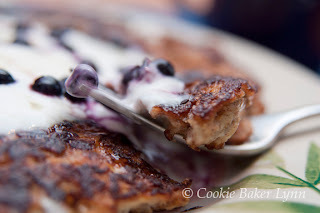 I used yogurt and blueberries. Other choices include: warmed honey, jam, peanut butter, caramel sauce, or, for the purists, butter and maple syrup. You are so lucky to have that handy hubby! I scored a cast iron pot a few years ago that was rusty--I cleaned it as best I could but it still wasn't great. I love love love it but just don't have the knack for seasoning. I wish I could pay someone to do it for me since that pot is just sitting there, begging to be used! Yum! Those pancakes look yummy! I've been using cast iron for ages. Wouldn't cook an egg in any other pan. Mines been seasoned to perfection. It's one of my favorite pans! I remember using an old rotary mower on my Grandma's lawn. It was pure torture (mostly crab grass) but I got paid well. ;) I could definitely go for those pancakes, apple frittery type things are awesome! I love my cast iron pan, too. It is my precious.o I think it will out live me. 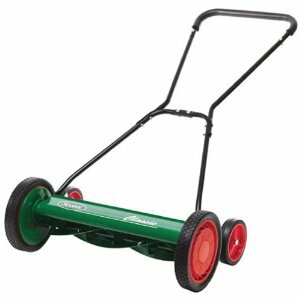 i could handle the push mower--we had one too--but 55 degrees? i 'd be positively miserable! I love my cast iron skillet and am so glad that you have one...it's the best for so many cooking applications. The pancakes sound yum. Had you considered adding some shredded yams/sweet potatoes along with the squeezed out shredded apples? You might like it, especially with some warmed honey. We found a cast iron skillet that we still use today on the side of the road from the Sharp Company in Brockville, Ontario. As for the pancakes I am wishing for the morning already.